Goon Squad: What Happened to the Planes and Passengers on 9/11 & Flight 93 Mysteries? What Happened to the Planes and Passengers on 9/11 & Flight 93 Mysteries? Who Really Recovered the Remains in Shanksville? The FBI took control of the crash scene. [Wallace] Miller had charge of a provisional morgue six miles away. Across the county, at Seven Springs Mountain Resort, he would meet with families of most of the victims. Miller was among the very first to arrive after 10:06 on the magnificently sunny morning of September 11. He was stunned at how small the smoking crater looked, he says, "like someone took a scrap truck, dug a 10-foot ditch and dumped all this trash into it." Once he was able to absorb the scene, Miller says, "I stopped being coroner after about 20 minutes, because there were no bodies there. It became like a giant funeral service." "I wouldn't know how there would be any possibility how any remains would get to Dover… As far as I know, nothing else left here except the DNA samples." The ground magically swallowed up the remains, no evidence, means no messy investigation! "It was as if the plane had stopped and let the passengers off before it crashed," [Somerset County coroner] Miller said. Miller said the lab is continuing to test DNA material to verify the deaths of the last six crash victims. He said DNA tests won't be able to identify the four hijackers on board. The Boeing 757 of Flight 93 is a plane that is 155 feet in length with a wingspan of 124 feet. Can't you see the remains of a 200,000 pound airplane in the photo below? C'mon, use your imagination! Jon Meyer, the first reporter on the scene, said he was "able to get right up to the edge of the crater" where Flight 93 supposedly hit the ground. However, he described: "All I saw was a crater filled with small, charred plane parts. Nothing that would even tell you that it was the plane. ... There were no suitcases, no recognizable plane parts, no body parts." 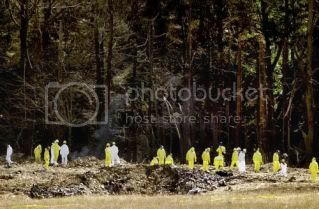 And although Flight 93 was reportedly "heavily laden with jet fuel" when it crashed, investigators found no contamination from jet fuel in the soil and ground water around the site. But even though Flight 93 supposedly disappeared into the earth, the crater allegedly made when it hit the ground seems to have been too small for this to have been the case. Frank Monaco told reporters that the "V-shaped gouge" created by the plane was "eight to 10 feet deep and 15 to 20 feet long." Roger Bailey, of the Somerset Volunteer Fire Department, recalled that the crater "wasn't deep. Ten to 12 feet deep." Bailey said he "thought it was a hole that they had dug to burn garbage." John Maslak estimated that the crater was "maybe 25 feet wide and 40 feet long," and "ten to 15 feet deep." After the ground had been excavated in order to recover the wreckage of the plane, the crater was still only 35 feet deep, according to the FBI. Flight 93 had a wingspan of 125 feet, a tail height of 44 feet, and was 155 feet long. Is it really possible that such a large plane, when it hit the ground, would make a crater only about 40 feet across and 25 feet wide, and disappear entirely into soil just 35 feet deep?